The CoolSculpting procedure combines the fat-freezing technology cryolipolysis with advanced proprietary engineering. What makes CoolSculpting different from other non-invasive modalities for fat reduction is its advanced cooling technology that selectively targets and eliminates fat cells gently and gradually while sparing all other tissue. What kind of improvement can I expect from CoolSculpting? Studies have shown that one CoolSculpting treatment can reduce the size of a fat bulge by up to 20%. Most patients can begin to see results as soon as three weeks after treatment, with the most dramatic results occurring over a period of two to four months. CoolSculpting is FDA cleared for fat reduction on the abdomen, hips, flanks, upper arms, back, bra rolls, inner and outer thighs, underneath the buttock, and under the chin. How much are the costs for CoolSculpting in Fairfax VA? In Fairfax Virginia, treatments begin at just $750 per area of the body. The total cost of your CoolSculpting treatment will depend on the number of areas you would like to treat and how many treatments you need to achieve your desired results. Compared to liposuction, CoolSculpting can be a fantastic alternative for many patients who want to reduce in specific areas with little to no down time. The CoolSculpting device controls the rate of cooling during the procedure, resulting in a reduction in fat that is visible in two to four months. Fat cells in the treated area are gradually eliminated through the body’s normal metabolic processes. Is there any down time with CoolSculpting? With this non-invasive “fat freezing” technology, there is no need for needles, no incisions, no anesthesia or pain medications, and little to no downtime. Most patients are able to resume normal activities immediately following the procedure. Some mild, temporary numbness, tingling and soreness are possible, but these effects rarely inhibit activity and usually resolve with a couple of days. Using a specially designed cooling applicator, the CoolSculpting device is applied to the desired area of fat reduction to extract energy (cooling) from the underlying fat tissue without damage to other tissues. A gentle vacuum pressure draws the tissue between the cooling panels, delivering precisely controlled temperatures that have been proven to target and dismantle fat cells in specific areas of the body. As your fat cells are exposed to the precise cooling, they naturally die off, which results in a gradual reduction in the thickness of the fat layer. The most popular non-surgical fat reduction treatment is getting even better. 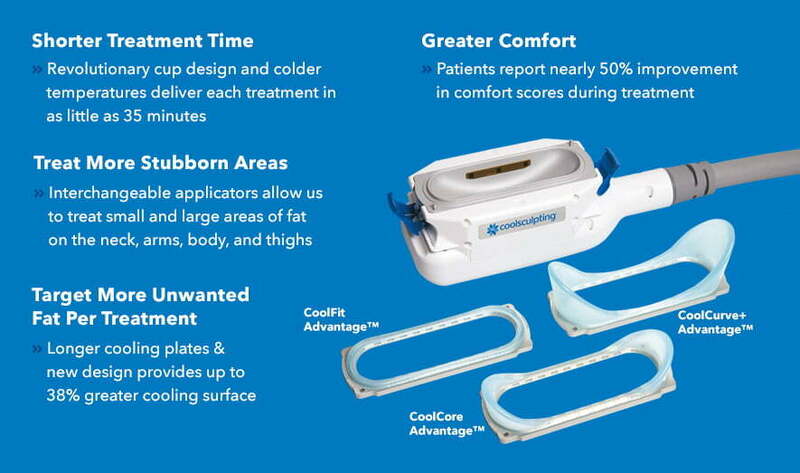 With today’s advanced CoolSculpting technology, including the CoolAdvantage applicators, we can target more fat cells per treatment, and we can treat more difficult problem areas than ever before. In the past it has been a challenge to place the device right where we want it. The CoolAdvantage applicators have a nearly 40% greater cooling surface area, yet the smaller design fits on arms, inner thighs, and other common areas where patients really want to reduce unwanted fat. While nobody has complained about the original method of treating these areas, we are confident that CoolSculpting will be even more effective with this new design. What’s the advantage of the CoolAdvantage applicators? Achieving greater reduction and a more comfortable and appropriate fit, new technology can improve both your experience and your results. To learn more about CoolSculpting and if the “fat freezing” procedure is right for you, contact Hess Plastic Surgery in Fairfax, VA for a free personal consultation.